Christmas at London’s Bar Soho! Quirky and creative, a Christmas at London’s Bar Soho can guarantee you are different night from any other, with unique décor to awe at while tucking into a delicious, festive buffet and some tasty drinks. 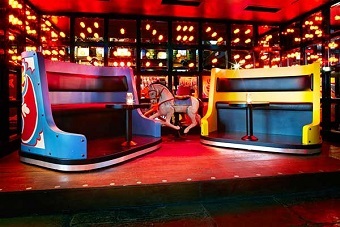 Any Christmas party in London offers a great experience, however this venue is an experience like no other and will definitely be one to impress the team with its carnival themed rooms and sweet champagne cocktails. This Christmas party includes a festive buffet and some complimentary drinks, making for a more light hearted and fun celebration than a formal meal or dinner party. Having the food and drinks within the bar venue means you can enjoy your whole night all in one place, saving money and stress on travelling back and to for a full evening to remember. When your team arrives, a member of staff will guide you to your reserved area, which will be yours to enjoy throughout the night. A Christmas at London’s Bar Soho include luxurious seating and is the perfect place to chat and discuss any exciting plans for Christmas before the food is introduced. When you’re all comfortable, the festive buffet will begin for everyone to tuck into, no matter how much food you fancy! The finger foods offer a huge array of tastes, including the traditional mini Yorkshire puddings and Christmas dinner on a stick as well as some fig and honey tartlets and red Thai chicken skewers – so there’s definitely something for everyone. The best part about having a buffet is not only the variety, but how social it can make your team over something like a meal. A buffet means everyone is walking around, chatting and generally creating a great, upbeat atmosphere to carry on the night with some Christmas cheer and make some festive memories. Along with the tasty treats, each person in your group will receive either a half bottle of wine or 2 bottles of beer each to really get the night going. If you’re looking for a really exciting and informal Christmas night out with the team. If you have any questions or just want the whole activity organised for you, give us a call on 0161 341 0052 and our events planners will be happy to help!